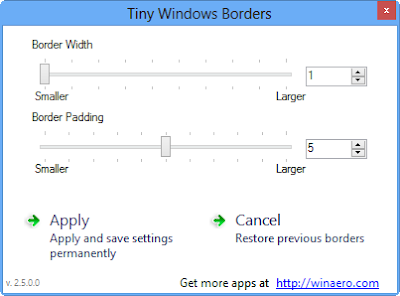 If you open any new windows in window 8 you will notice the border of that windows , out of the fours windows border we can customize the three sides of borders left,right and bottom .By default the border of windows is little bit thick , you can easily reduce width of the borders and also increase to , there will be two ways of doing that , one will be using the registry changes and other by using a small tiny app called Tiny Windows Borders , we will only focus on how to changes it via app only so to Download this app from the below link. After Downloading the app open it , you don’t need to install it because it is just a normal portable app.See below pic how the app looks after opening it. 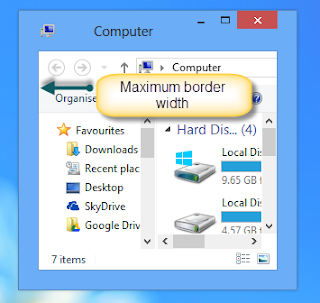 But if you want a thick border style then move border padding to larger and then also border width to larger , you will see the most thickest border in your window see below pic how it look on my computer after applying such setting’s. 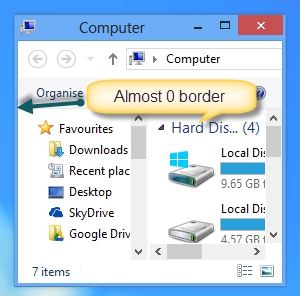 If you want to revert back to your default border thickness then choose the cancel button and you will revert back to your original border thickness of windows.Increasing and reducing thickness of Windows 8 border can be use with third party themes , which with third party themes provide more styling to your windows 8.That’s all for today post i hope you will like my this if you have any query please leave comment and please don’t forget to subscribe to my blog .